Traffic barriers line Sheridan Road. 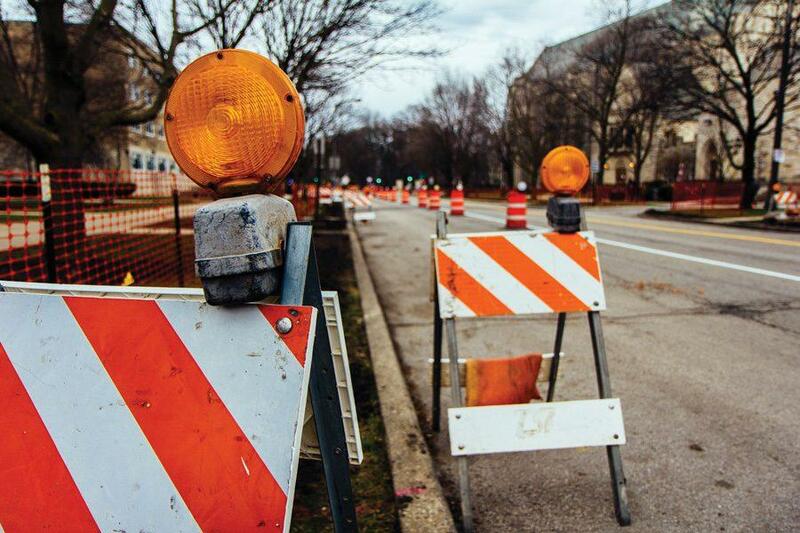 The city's three main construction projects are proceeding quickly despite unforeseen delays due to the state budget impasse and long lead times. As fall begins, Evanston may look a little different to those who have been away all summer with the progression of the city’s three main construction projects. The west side of Sheridan Road between Chicago Avenue and Lincoln Street is now complete, according to a city news release. Construction on the east side of Sheridan Road started Sept. 1. Due to the Illinois budget shutdown and “unforeseen utility conflicts,” the project experienced a delay of about six weeks, but is “proceeding briskly,” according to the release. By mid-October, work between Chicago Avenue and Lincoln Street is anticipated to finish, at which time the contractor will cease work until spring 2018. For the improvements to Fountain Square south of Davis Street, curb and sidewalk work is “substantially complete,” the release said. Foundation work on the south plaza area has begun and is expected to end in October. Work on the north plaza area has also begun, but due to long lead times for the memorial wall and fountain, these items will not be completed until spring 2018. As with the Sheridan Road project, the contractor will be offsite during the holiday season and return in the spring to complete work. Though most construction at the intersection of Emerson Street, Ridge Avenue and Green Bay Road is now complete, the volume of traffic has increased 75 percent or more, according to the release. Drivers are using the intersection as an unofficial detour route as construction on Sheridan Road continues. New traffic signals have been installed to help with the backups. Still, mast arm signage that is being added to Ridge Avenue is not expected to be installed until late this year, and substantial improvements to the traffic situation are not expected until the Sheridan Road construction project ends in October.